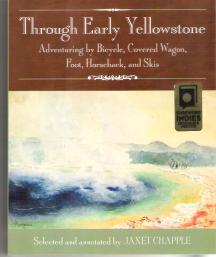 Through Early Yellowstone: Adventuring by Bicycle, Covered Wagon, Foot, Horseback, and Skis won Honorable Mention in the 2016 Foreword INDIES Book of the Year Awards, in the Travel category. Foreword Reviews announced the winners of its INDIES Book of the Year Awards on June 24, 2017, during the American Library Association’s Annual Conference in Chicago. See the review here: https://www.forewordreviews.com/reviews/through-early-yellowstone/. The awards recognize the best books published in 2016 from small, indie, and university presses, as well as self-published authors. View all of the 2016 winners. “Being a Foreword INDIES winner is a big deal: in a year with a record number of entries, your book was selected by our editors as a finalist, then judged as a top pick by the librarian and bookseller assigned to your category,” wrote Michele Lonoconus, awards director of Foreword Reviews. Over 2,000 entries were submitted in 66 categories, with Foreword’s editors choosing the finalists, and a panel of over 150 librarians and booksellers acting as judges to pick the winners.